Cupping is good for promoting healthy looking skin, lymphatic flow, circulation, and combating the appearance of cellulite, stretch marks, and dull skin. This convenient cupping treatment will leave your skin feeling and looking beautiful. Use this every day at home for maximum results. 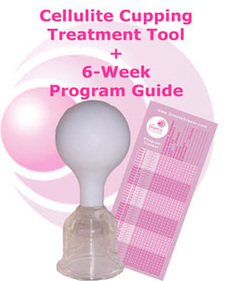 Includes one cupping massage tool plus a 6-week program and progress tracker (electronic download). The unique suction action of the cupping tool targets tissue and circulation within the layers of the skin (which is not targeted by conventional circulation and fat reduction techniques). Convenient hand held manual tool doesn't require batteries or complicated application methods. Please check with your physician before starting this or any other program. The sooner you get started, the sooner you will see results! NEVER use the cupping tool on any body orifices or skin folds such as the bellybutton, skin creases in joint areas, groin, etc. Don't forget to take your own before and after photos!